I saw this series mentioned in the magazine Entertainment Weekly and looked for it online. I was pleasantly surprised to see the episodes posted on YouTube. I just finished watching this particular episode and have to say for a "fan" effort I thought it was far superior to any of the spin offs. I think Gene Roddenberry would be very pleased with what's up there on that screen. What kept going through my mind is that I was watching something that should have occurred thirty years ago. 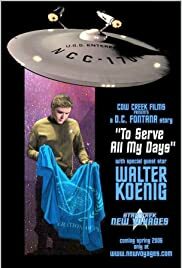 I always felt that the spin offs had been taken over by people who really were not fans of the original and that Gene Roddenberry's original vision had been butchered horribly. "Star Trek: New Voyages" is what should have happened all those years ago! As for the actor who played James T. Kirk, it was some what weak. I see that he executive produced the series. I wish he had checked in his ego enough to cast another actor closer to the appearance and mannerisms of William Shatner. His abilities are a little bit of a disappointment but is excused for the amazing production values and dead-on set and prop designs. Also the ships are all faithful to the original series. So, taking all that into the equation I will forgive this actor for not being able to resist taking the role of Captain James T. Kirk for himself!